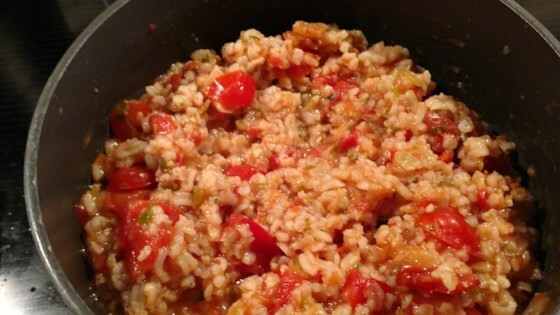 "Easy Spanish rice using brown rice instead of white." Combine rice and garlic in a saucepan. Stir in water, salsa, and diced tomatoes. Bring to a boil. Stir rice mixture and reduce heat to low. Simmer, covered, for 50 minutes. Turn off heat and allow rice to sit, covered, for an additional 5 to 10 minutes. Stir rice before serving. This Spanish rice has lots of rich flavor, and is very easy to prepare. I have to admit I was surprised at how much I liked this. Will make it again! Thx! My family and I love this recipe! It's so fresh and tasty. We add onion like Arizona Desert Flower suggested. I used quick cooking brown rice and it was delicious! Will definitely be making this one again!